This versatile chrome-plated footed cooling rack is the perfect tool for all of your baking needs. Designed to prevent your food from sticking to the bottom of a half size bun / sheet pan, this rack can hold everything from bacon to chicken tenders. Not only will it keep food from sticking to pans but it will raise it out of the grease left behind from cooking! Use in conjunction with my Carlisle 601824 Half Size 18"x13" 18 Gauge Aluminum sheet pans and they fit like a glove and perform very well. I couldn't be happier with the size and strength of these cooling racks. They are just the right size for an order of cookies and they store well with the cookie sheets. This has made a world of difference in my home cooking. fits perfectly within the appropriately size sheet pan, and helps me cook proteins especially well in the oven. I often use it for a whole spatchcock chicken with great results - without the rack, the skin would be ruined by moisture in the bottom of the pan. These half size bun pan cooling rack is just what I was looking for! They are really good quality and will hold up well to lots of use in our HS culinary classroom. So happy with this purchase! I use these racks for a multitude of things including cooling cookies. But They are easy to clean and fairly non stick depending on what you are using it for. Highly recommend. Very nice looking cooling rack. You can't beat it for the price you pay. It is a high quality cooling rack and cleans easily. I would certainly recommend this rack. These are the perfect size and make storing them when not in use, a cinch. They are easy to clean. I'll definitely be buying more of these! Fits in the half pan well and keeps the item in the oven from getting soggy in its fat. Also can be used as a cooling rack. These are great cooling racks but pay attention to the size as half size here is not the same as a half size sheet pan. I had been shopping around to replace my old racks. These are the best I've had. They are quality grade with a wonderful strength and design. I have used them as cooling racks and to place on the half-sheet pans to bake in the oven. I've hand-washed them and run them through the dishwasher. A great product. I use these for cooling small cookie sheets, pies and desserts. Not too bulky or heavy; they're easy to move around with one hand while your holding a hot pan in the other. These racks fit nicely in our decades old sheet pans! They serve their exact purpose perfectly. My only (very minor) gripe is one of them doesn't sit perfectly flat on the counter as there is a bit of a wobble. This is a very nice cooling rack, especially for the price. It is better quality than some I have had and paid much more for. The only issue I ran into is the label peels off leaving some glue residue, but it cleaned off instantly using a little rubbing alcohol on a paper towel. I have used these for everything from glazing cakes, to draining grease off of bacon. Make sure to dry them well so they don't begin to rust. These sturdy racks are imperative to allow circulation for our product and the footed aspect does that. They fit the half sheet pan perfectly and are easily cleanable. Since finding these racks, I have found numerous uses for them outside of their intended use, and my collection is ever-growing. Other than using them as cooling racks, I also use them for dehydrating food, decorating scones, cakes, and cookies, as draining racks, to keep the animal food dishes off the floor to aid in air circulation, I have one by the door for muddy or wet shoes, and under my compostable compost bin (paper-based, and without air circulation, the bottom sweats and weakens), just to name a few. I just purchased 10 more, and am sure I will find even more uses for them in the future. Great product, very well made, great price, and very versatile. We love these cooling racks, they are perfect for cooking bacon and ensuring the grease drips below the bacon. You can use them on a small baking sheet or fit two on a larger baking sheet. This cooling rack fits perfectly on half size baking sheets. It’s good for cooling hot pastries, a steak off the grill, or a cake out of the oven. Comes with a very beautiful chrome shine. I absolutely love these wire racks. They fit the generic Webstaurant half-size sheet pans perfectly. So far a satisfactory performance for cooling breads, baking chicken wings. No bending or rust yet. Would recommend! I finally got a cooling rack! I am so happy I found this website. The products are inexpensive and great quality. I used to just allow the baked goods cool in the pan (I know that's not good). Now I have these to allow them to cool properly. THESE ARE GREAT! I use them in the oven if I am oven 'frying' something, and I cool all my cookies and breads on them. They store easily, and are relatively easy to clean. I've been using mine for months, and they haven't rusted. Super heavy duty. Better than any other I own. The rack is strong and does not flex. I've used these for cooling cookies but I have roasted meat in these and they came out perfect. It’s a nice cooling rack for the price. I’ve noticed most of the cooling racks I have gotten from the Webstaurant store are a bit wobbly, 1 foot is usually off the ground. But just a little, and it’s no big deal. But I thought I would mention it for anyone who might find it an issue. This is a great product at a price that simply can NOT be beat. ANYWHERE! I use it for primarily for bacon, but obviously, it can be used for a staggering number of applications! These are awesome for cooling a small sheetcake or a dozen small cookies. I use these for my bakeshop often. They are heavy and sturdy metal and the wire weave is close together. Bought a couple dozen of these racks . They come im very handy. Fit the quarter and half sheet pans perfectly. Easy to clean up too. I didn't realize how important these were until I purchased this cooling rack. My cookies were often left in pans or cooled in parchment, resulting with stiff hard cookies; now they're soft and chewy. The price is also great. This is a really great rack, not only good for cooling baked goods but also when I make chicken wings it keeps them out of the oil. Great cooling racks for our donuts. Easy to clean and great price. We plan to order a few more to help with larger orders soon. Good quality and perfect for what we needed. We bought 10 of these and they are holding up great. Will buy more when we need more. This half size cooling rack fits perfectly in a half size baking sheet. It stands a little over half an inch tall. Really sturdy wire construction with chrome plating that shows no signs of wear. This grated cooling rack is very sturdy and is made of high quality materials. It is very easy to clean and has held up very well. These are fantastic for the price. Durable, easy to clean and overall a great buy for sure. I would recommend to any of my hospitality friends! This cooling rack is my go to for small baked goods now as it is nice and sturdy and easy to clean. The half-size fits easily in smaller areas and for small cakes it is perfect. This is a decent cooling rack. I regularly put in a pan and use it to keep meat raised off the bottom. The dimensions are a bit mismatched with the pan I have, but it works alright. A bit annoying to clean, but it has held up well. Great Quality. Highly recommended for all serving needs. Very durable to heat and easy to clean and store. Suitable for all kinds of use for sure. These Half Size Footed Cooling Racks are great for cooling cakes, cookies, and frying foots. The racks are very sturdy I use two of them inside of a full sheet pan which is the perfect fit. VERY DURABLE. I need to purchase more. These come in handy. Also allows your cakes, cupcakes and cookies to cool quick. I place them on my full pan on the cooling rack. A typical sheet pan rack, quality is good and none of the wires have come loose yet nor start rusting. Would buy again if needed. Very well made cooling rack, heavy duty materials! These are a must have, and serve a variety of uses in our kitchen. The low price is almost unbelievable! started to oxidized after a couple of uses, the edges are not well finished so its easy to hurt your self with the corners, i wouldnt buy again.. Thank you for your review, Laura! We are sorry this Half-Size Footed Cooling Rack for Bun / Sheet Pan has not worked well for you. A Customer Solutions Representative will contact you soon! Great grid size and very strong to hold heavier items. Just wish they were a little wider so they fit bun racks better. You have to be careful not to bumped the or slide them accidentally one way or the other or they fall. These were priced so well so i decided to try them. They are very sturdy as well and i use them to rest by larger cakes on for cooling. My only complaint is that the edges could be a little smoother as kitchen towels and other cloth can get snagged easily on them. These racks are so good to have around your bakery, for cooling or pouring chocolate over a bakery item or for sitting muffins on to sell. Good product given the price point as they've gotten me through 2+ years in business and are still going strong; though they are starting to show their age with a bit of discoloration where the gridwork is fused together. And while they were never really "square" I've only just noticed some warping to where they don't sit quite flat but this doesn't affect their efficacy; I'd buy these again if I needed more. I purchased 2 of these pans for use in my new home. While this pan is a good upgrade from typical store-bought pans, it is not perfect. It has a decent thickness to it, it dents fairly easily. However, if you are careful with how you use the pan and properly prepare the food on it, you shouldn’t have the same issues. Also, these are not as easy to clean if any sauces or burnt food gets stuck on. It takes a lot of elbow grease to properly clean them if this is the case. If you are just looking for something to cook cookies on, this item is perfect in thickness, size, and durability. Fits perfectly in my half sheet pan. I have also noticed, as another reviewer said, that if you leave them sit in the sink they will rust. So if you're hand washing be sure not to let them soak. This rack serves its purpose well. It is not on the expensive side and is durable. The one thing you have to keep in mind here is, to get the right size sheet pan because this rack won't fit into all half sheet pans. This is a very good product and good price. We use it for cooking bacon and sausage in the oven so the grease drips away from the food. It holds up to scrubbing and sanitizer machine cleaning. I've been searching for a high-quality, heavy-duty, cooling rack that fits standard half-size sheet pans; and I've found it! Great price point, VERY solidly built, and fits an 8" x 13" half-size sheet pan perfectly! I use them to raise spatchcocked chickens off of the pan to allow for air circulation and drippings, as well as give space for herbs and citrus. They can be hard to clean, but I recommend a good scrub brush. Awesome cooling rack. Just a little bigger than my bakers mark half size bun sheet pan. So it’s not actually flushed inside the pan but it still works. These racks are nice and sturdy and work well. Some of them were a little unstable when putting them on the counter, but not by much. Sometimes they don't fit in some of my half sheet pans, but I think that's more the pans fault than the racks. I know they're cooking racks, but we love using these racks with a half size baking sheet below to keep the meat out the drippings in our smoker. It keeps our ribs from being greasy while allowing the juices to steam them from below. Works great with sheet pans for broiling and roasting. Easy to clean. We also use these racks as cooling racks for cookies cakes and more! Sturdy cooling rack for a 12x16 half sized sheet pan. Perfect as a cooling rack, but we also use it at times to bake proteins so the fat can drip down. After 30 washes, still maintains shape and has not rusted over. This is a nice 12 x 16" cooling rack. I like that the feet are short, so easy for cooling. Overall this is a good quality cooling rack. i like these racks, they fit perfectly in my Vollrath 5303/P pans. You will need to wash and dry them quickly as they will get rust if left wet/damp for too long, but i honestly did not fine this an issue or reason i would not purchase them again. Great and durable cooling rack. Sturdy enough to rest a large cake or many fried items. Fits perfectly in a half baking sheet. Highly recommend! Sturdy, great quality racks. Tossed all the old rack's out these are amazing. Well be used weekly. I will use them for cupcakes, cakes, pies, muffins, etc. Some sharp edges, beware of that. This cooling rack has heavy duty thick and strong metal. I use it for meats and for baking. A must have in any kitchen. Also best price around. This is a very sturdy rack. It fits perfectly in a half sheet. It has held up quite well over the years. It's easy to clean, too! Great product! I’ve used this rack to bake multiple types of meats. I have not had any of them stick and they all stay out of their oil drippings. The holes are small so there are no meats or whatever your making falling through. Heavy weight for a cooling rack, but does the job. It is a good value for the price and sufficiently does the job. Would consider paying more for a lighter version. Fits perfect in half sheet pan. Did not warp after multiple uses in oven. Easy to clean. Plus, great as a cooling rack. Best price around is at Webstaurant. These are great for cooling things or when roasting something on a sheet pan to keep air circulating underneath. Because of the way the the rack is constructed, there are some nooks and crannies where the wires cross in which food collects, so cleaning it by hand is a bit of a struggle, but a dishwasher makes short work of this. The rack could be redesigned, but for the price and sturdiness, this product is a clear choice over most others. This fits perfectly for half-size sheet pan. I can use this for cooling baked goods but also for making crispy food. Nooks and crannies are a bit challenging to clean but those are by design so that's only a minor complaint. I ordered the one half size footed cooling rack and I have been pleased with the durability but a little frustrated at how difficult they are to clean. I would recommend cleaning prior to cooling. It is very difficult to make sure they are coated with Sprease but it does help a little. I use this cooling rack to cool my baked goods. I also use it to place my doughnuts on after frying them. This cooling rack fits perfectly in the half size pan. Works great for cooling any baked goods. It cleans well and goes right in my dishwasher. I wish I bought more and I am sure that I will. Great economical option for a cooling rack. They fit great in the 1/2 size pans. We use them to allow our baked goods to cool before packing. We have lots of these and would buy them again. We mainly use 1/2 size sheet trays when catering because our portable ovens are 1/2 size. These 1/2 size cooling racks fit perfectly into the 1/2 sheets we own and are very good quality. They are priced extremely well compared to our local supply store. We have used this for resting steaks and letting cakes cool after baking. I have the Vollrath half size bun sheet pan from Webstaurant and I got this cooling rack to go with it. Plus, it can also be used during baking to help air circulate around your food. Great, heavy duty quality! Perfect for letting cookies and other baked goods cool before packaging or eating! These are made of a solid stainless steel and haven't needed spray to prevent sticking, like some other inferior cooling racks I've used. Very durable and tough rack that doesn't warp or bend even under heat and weight. The feet are only about 1 cm tall so it's not much height which takes up less room and it does fit better into storage that way too. So much better than what you find in most stores. Can't be beat for durability. Price makes it easy to stock your kitchen. Love it! The 12 inch by 16 inch half size footed cooling racks are perfect for the half sheet pans. Fit well and are made with quality materials. I would recommend this product to anyone looking for a good cooling rack. This is a great cooling rack. It IS low, but I don't think that that impacts its functionality. However, mine did come slightly distorted. This may have been prior to shipment. The legs did not touch the floor on a flat surface. I have tried to bend it back to shape, but it's still kinda wobbly. These are now my favorite cooling and glazing racks! They fit inside half sheets perfectly, are well made, and clean up easily. Purchasing more to replace costlier yet lesser quality ones I had been using from another supplier. Nice cooling rack for the price. Criss-cross structure gives extra support which is nice. For the price, this is a great buy and nice to have around for those occasions when you need multiple cooling racks for convenience or necessity. However I take off 1 star because compared to other "cooling racks", the legs on this are a little short not giving as much room for air flow underneath. Also is bare bones, no non-stick treatment which is hardly necessary but nice to have. So all in all, good for the price but nothing special, short legs are a minus, criss-cross is a plus. A must for baking to cool off cookies or cakes when removed from oven. When paired wth the same sized sheet tray, we use it for seasoning meats on the line to keep things cleaner and organized. This is an awesome addition to any kitchen. This size is perfect for a residential kitchen as it holds a generous amount of cookies, pastries, and cake layers. Good quality for the price. It fits perfectly in our half sheet pan, which is a great help in the kitchen. Will continue to buy again and again. Webstaurant's delivery is the best. This cooling racks could have multiple uses whether it is for after baking or cooking meat. I have used them for cooling off cookies and for cooking prime rib on top of so the fat drips under it. I love these thins. They a be used for cooling items after cooking/baking or they can't be used in cooking to keep product from swimming in juices or oil. Great for baked crispy items. The cooling rack fits my bun pan perfection. I have used it for baking and and as drip tray for frying. I searched high and low and this is the best price that I have been able to find for this item. Not sure how I used to cope without these bad boys. I use them all the time, not only for cooling cakes and cookies, but for protecting my tabletop when i have multiple pots, pans, and other dishes coming out of the oven. I like the way the criss-cross is fabricated, making it easier to clean - you wipe one direction on the top of the rack, the other on the bottom. Less food particles left clinging to the wire. We needed a cooling rack for baked pastries at our custard shop. Wanted something small and less bulky, this really works well for our cooling needs. STURDY! I love my cooling racks and now that I'm writing this review, I realize I need to place an order for 4 more. Did I say sturdy... I love the fact that I don't have to worry with them falling over when I place a cake on them (especially, my cheesecakes), as they aren't flimsy like some I've had in the past. More the better, when it comes to cooling racks! As we expand the need is great, and we use this rack on a daily basis!! Will buy more!! Perfect for cooling popovers, bagels or pretty much any pastry. these half size in convent to store and less likely to warp over the bigger ones. Works as advertised. Fits the cookie sheet pan just right. easy to keep clean. will probably be ordering more in the near future so very pleased. What can I say. Cooling racks are an important past of any kitchen. These fit half baking sheets perfect and are great for cooling a small well as to coat frying foods after dredge and before going in the fryer. Horrible! Yes, I got a refund for this (thanks customer service!). I am giving this one star, both because I am not sure I can give zero stars, and also because it's not a terrible design, except for the horrible, horrible, horrible chrome plating. All I did was briefly handle it to wash it off after receiving it, and not only did sharp edges rip my protective gloves, I got a tiny splinter of flaked off chrome in my finger. Ouch! This goes straight into the trash. Now if this had been made out of stainless steel, and did not have any sharp edges, I would have been quite happy with it. We appreciate your review Lavern! We are sorry you had an issue with this sheet pan, our Customer Solutions team was happy to assist you with a refund. A great rack for all means of cooling, drying, glazing, etc. We have not had any issues putting this right into the dishwasher. Stacks well into half-sheet baking pans. Nice foor cooling my cakes i lice its very thin and i can use for mirror covers and chocolate truffles, its a helpful tool in fact. Fits perfectly snug in a half sheet pan, great for baking bacon, oven frying, and cooling alike. Depending on the product cooked, a long soak and scrub with a brush may be required to clean between all the tines on this product. This is a great, sturdy cooling rack. I cooked an 18 pound turkey on this and was able to pick it up by both edges and it barely sagged at all. After two years, I don't see any rust or broken welds. Great product. Good quality on this 1/2 pan cooling rack. We use these daily and Webstaurant Store has the best price. This one is high quality and we are happy with the purchase. I really like this cooling rack. It works great for everything not just for buns! You will love it! Great quality and price too! I can't live without this one! I love this footed cooling rack because it is very useful in my kitchen. I also use this tack for draining fried food! Durable metal. I actually use this cooling rack more for elevating foods when baking/roasting than for cooling, but it works great for either. It is nice and heavy duty, and has a durable chrome coating that makes cleanup easy. I like that this 12x16 Half size footed cooling rack has a set of feet in the middle of the rack. I make it very sturdy and doesn't sag in the center. This is a great little cooling rack and supports a decent amount of weight. This is perfect for setting breads and cakes on when they come out of the oven so they do not burn my counter top and the air underneath allows them to cool quickly. This product meets my business needs. It is of good quality and at a great price. It cleans up easily and seems like it will last a long time. No rusting seen so far. This is an easy to clean and very durable cooling rack. The feet on this are ideal because it's not the fold out kind, it's small metal feet that can't break off easy! Perfect size for a 1/2 sheet pan. Great for cooling cakes and pies, as well as draining fried foods. Also great for baking/roasting on in the oven, as the holes in the rack are fairly small. Compared to the larger version of this cooling rack, the 12x16 is probably one of more solid and stiffer of the cooling racks. The spaces between each foot is shorter and than than using just 4 feet as expected for its size it uses 6 feet. This prevents for cooling rack from deforming as much and means who can add heavier items for cooling without the worry of bending. This will be used for cooling cookies, bread, meat, and cooking some bacon if I don't feel like cooking it in my cast iron. This cooling rack also works well as a drip rack when decorating cookies with icing. Helpful that size is compatible with the 1/2 sheet pan. This cooling rack is very strong and sturdy. It fits into the sheet pans perfectly. I'm very satisfied with this purchase and will order more. Lots of uses for this Cooling Rack. Besides cooling baked goods, I use it as a base with sheet pan to hold items that need to be glazed. It also works well with a sheet pan to roast meat or vegetables, or to lay out and dry spinach and other greens quickly. I always spray with a baking spray such as Pam when roasting on it- to make clean-up a little easier. Do not let the price of these cooling racks fool you. These cooling racks are very welled made. Very sturdy strong metal. No bending or warping. They fit perfectly into the half sheets pans I have purchased from WebstaurantStore. But they can be used perfectly by themselves. The price is unbeatable. Must have for baking. These are really heavy duty draining grates and fit perfectly in a half size baking sheet. These are much sturdier than my other grates that i use for cooling racks. This works great for letting cookies cakes and cupcakes cool and easy to use! You really cant beat the price. Great purchase. Would highly recommend. works well as a draining grate or for roasting over a sheet pan. Well made, seems to be durable so far. fits perfectly inside a half sheet without gaps around the edges. great pan for roasting vegetables, use it with a half sheet pan to collect moisture, no more soggy vegetables! also works great as a cooling rack. I like this cooling rack but what really bugs me is the way it's put together. The top parallel wires are suspended above the rest of the rest of the frame and the ends of the wires are actually kinda sharp. They're pointy and hit your hands while handling it. Other than that the rack is well made and works very well. Fit's nicely inside the half-size sheet pan I bought from here. But because of that one aspect I can't give this 5 stars nor do I think I can actually recommend it. Great price for a very well made draining grate. If using with a half pan, be sure to measure to confirm draining grate will fit. These draining grates are great! They're the perfect size for drying a rack of 12 - 17 cupcakes or cookies. I bought two, enough for when I make multiple batches of goodies for the holidays! I use these for cooling all of my cakes and cookies. The center supports are excellent and help ensure that cakes become uneven when they cool. I love these and use them all of the time! Good fit and sits just below lip of pan. Would advise to get the higher end grate if your going to use for bacon as after a few months of use and hard scrubbing the finish wears off and you have a rusty grate. Grate is a perfect fit to my half sheet pans. Holes are a little bigger than 1/4". Also good as a cooling rack on a counter as the feet give enough raise up. I really like how well this fits into the 18" x 13" half sheet pan I purchased through Webstaurant Store online. I make bacon on this in the oven, which is much healthier since all of the grease drains to the bottom of the pan. If you lay a sheet of parchment paper underneath, it makes clean up a little easier. I also use this to make shish-ka-bobs in the oven, which helps provide better air circulation around the food. These draining grates are great for many things! Love this extender for baking cakes and brownies. Easy to use and easy to take out the cake when done. I used parchment paper cake came out perfect every time. This works great for letting cookies and cupcakes cool and fits neatly on the counters and is easy to clean and use! Would highly recommend. A very nice replacement rack. Higher quality and a better price than I was buying at Franke. The holes are also small enough so no food will drop through. You really cant beat the price. Beyond just the price these racks seem to hold up quite well, and have survived a few trips through a (home) dishwasher. They work great for cooling breads and cakes from the oven, but my primary use is drying food out of the fryer and again they work perfectly and after months of moderate use (who doesn't like fish tacos nights all summer) they are still holding up very nicely with no real signs of wear or damage. I love these! Multiple uses. Can be used as a cooling rack, a draining rack for icing cakes and doughnuts with glaze, and they fit inside a half sheet pan perfectly. Can't go wrong with this price. Buy as many as you can. I've washed multiple times and hasn't rusted. Decent quality and oerfect for cooling items. Grate product (so funny). Cooling, draining, baking, dicing eggs. Very versatile and helpful in the kitchen. This fits my larger commercial half sheets well, but is a little too big for my store bought pans, so keep in mind you need at least the full grate dimensions on you pan. Would recommend. I bought these as cooling racks for my bread. It's a very dense German-style recipe and these have proven up to the task. So much better than the cheap racks for home use. The only downside I see is quality control. I ordered two and one is nicely put together. The other one has the supports welded on at an odd angle and there are some rough metal bits from the welds. It's also a little warped. But it will work fine for my needs and considering the price I'm very happy. Great footed grate sheet pan. Used for many purposes like cooling cakes and cookies. Also fist great in our stainless pans and used for fries. nice price. Perfect grate!! Fits inside a sheet pan nicely to, perfect for cooling, draining, and great for our glazing stations. Will purchase more! Very high quality, no rusting and easy to clean. Great, even surface. Perfect to use with half sheet pans to help keep items out of unnecessary grease or fat when cooking or cooling. Also can be used to dice soft items such as avocados or hard boiled eggs. Looked for something to use to drain our fried food without needing a lot of paper towel (save the planet!). These are perfect when using the baking pans. Saves money too! I love using this great for a lot of different things but I like to use it for drying out my fondant when I put things on cakes. The small holes don't let little intricate details fall through. The feet keep it up off of the counter so the air can circulate underneath as well so I highly recommend having one of these . Snagged two of these for the sous (she does most of the desserts) and have annoyed her by claiming one and using it to smoke duck breasts two or three times a week. This poor thing is abused and after a year or so it is still holding up. Should buy a couple more to appease the sous I guess. These work "grate"! I have used them for cooling purposes and also to cook large roasts and other items. It allows the meat to stay out of the juices and roast all the way around. Works great for cooling breads and cookies. I have used it regularly for the past 2.5 years and it is still flat and sturdy with no signs of rust. A great purchase. This is good for a basic rack and works for things like cooling pastries, but isn't strong enough to take the weight of a heavy pan. OMG this is such a heavy duty draining grate. It's excellent quality and makes draining fried good easy. Drys crispy and helps with the excess oil. I would highly recommend this product. Love it! My one and only grate for all things baking. These grates with their raised foot fit snug inside my half sheet pans from webstaurant store and are sturdy for everyday use. These grates are great for cooling pastry and baked goods and has enough lift off the surface for air to circulate through. These are also great when I glaze a cake or entremet. Perfect for my sheetcakes and rounds. I was always having problems trying to cool the larger cakes... This works perfect. I actually need several more. We use tons of these in our shop. They have held up extremely well. We wash them at least once a day, sometimes twice. No rusting, no breaking at the weld points etc. I use this for cooling pizza and baked breads mostly, and it has been great. No warping, very sturdy, and fits a half sheet pan perfectly. Also, no noticeable oxidation or corrosion as of yet. This is an awesome draining grate or cooling rack that fits perfectly inside a 12" x 16" sheet pan. An added benefit is that the way the metal is attached to itself won't tear up your sponges when you wash it like many cheaper grates do. One of mine has a few of the wires not quite straight, but it doesn't affect how it works at all. Far better than standard cooling racks from a supermarket, and cheaper too! I make lots of candies and sweets, and this has been essential for enrobing candies in chocolate. This helps me to have just the perfect amount of chocolate on each piece, rather than setting it down on a piece of parchment where the chocolate may gather too much on one piece. I'd definitely recommend oiling it for this use though. It's also great for cookies and other baked goods. Well-constructed draining grate or cooling rack for whatever you need. We use these for everything from bacon to fried chicken to flat bread. Sturdy and reliable! This is absolutely perfect for cooking bacon in the oven! Just set it on top and it will get all nice and crispy. Then you can save the grease for cooking! I use these in my half-sheet pans routinely with the messiest products (candied bacon, roast chicken, etc). I hate the cleanup of any rack but these release food pretty well. They are sturdy, and I usually stick them in the dishwasher for at least round one of gunk removal. These make great extra cooling racks in a pinch, as well. This draining grate came in handy for us and were very inexpensive. They are sturdy and durable and still look new after two years of use. While the build quality is not that threat the 12" x 16" Half-Size Footed Draining Grate for Bun / Sheet Pan is very sturdy and feels very durable in hand, I was a bit un happy with the welding of the metal but it shouldn't affect the overall construction. These worked great for draining donuts prior to glazing over a sheet pan. Very heavy, well made. Great deal for the money; I ordered 1 dozen. These are wonderful! We use them for cooling off baked items, baking bacon, draining fried doughnuts, fritters, and when coating thin icings on doughnuts and cakes. These are excellent quality and quite durable. I purchased these to use in my smoker and have been very pleased. They are easy to clean and store. Frequently used this grate for draining bagels after poaching them - the directional wires allow you to use this like a peel and slide things lengthwise right off the cooling rack into the oven or a storage bin. Slightly more jagged than I would have liked but it still works well. Nice half sheet draining grate. Works well for draining foods fresh out of the fryer. Also works well for use as a cooling rack for cookies or other baked goods. Good quality construction. This fits perfectly into a half sheet pan. I use this for cooking bacon or chicken in the oven and i also use it as a cooling rack for cookies. Definitely a great, practical purchase. This draining grate/cooling rack works exactly as expected! I would recommend getting at least two of these to make flipping of cakes and other baked goods easier. This draining grate fits perfectly in a half sheet pan. It is extremely durable, and sits in a baking sheet without tipping or wobbling. Definitely a great purchase at a great price! These fit nicely within the half sheet pan. We use these on a daily basis for various pastries- mostly to drain off excess syrup. And occasionally we will use these to help cool food. So much better than my old racks, purchased at a big retailer. As you can see in my photo, these racks are reinforced both ways, and now my fragile baked goods don't collapse into big gaps. Also I like only having this one stable rack, instead of 2 cheap lightweight ones. I use these for cooling racks for baked goods. They are strong and have held up well in the water. No signs of rusting or breakdown of metal from constant cleaning. These fit perfectly in a half pans. They can be used for draining, roasting, or steaming. Very durable and cannot beat the price. I highly recommend. The grates themselves are fine, but the size does not fit inside my half sized sheet pan. Just slightly too big. It rest on one of the sides. I use this half tray rack to roast meats and vegetables. The holes in the racks allow air to circulate around the items, making them crispier. These racks fit nicely into a standard half size pan as well as being just the right size for about two dozen cupcakes. They are also good for cooling breads, pies, or just about anything else. This footed grate fits nicely with a half-size sheet pan. It's perfect for draining things or letting meats or baked goods cool. I recommend it. GET MORE THAN ONE! These draining grates are so incredibly useful, bacon cooking, food draining, cake cooling, ganache covering. You definitely need two separate ones for sweet and savory, they are difficult to clean. I would recommend buying at least three. If your primarily going to bake or roast on these, I would highly recommend to spend the additional money and get the stainless steel version. I purchased one of these and one of the companion half sheet. And I will definitely be back to buy a couple more for my house. Thank you webstaurantstore for the excellent price and quality of this item. & I will definitely recommend to all my friends and family. These are great draining grates. They perfectly fit 1/2 size (13x18) sheet pans. i use them from baking bacon to draining fried foods to using on a grill for a finee grate. they have not warped or discolored and have not had any rusting. I placed this inside a half sheet pan (Vollrath heavy duty ordered together) to bake diced potatoes and bacon slices. It did not sit flat, but rather slanted to one side. I picked up and replaced the grate, same thing. I eventually thought to rotate the grate 180*, and it was much closer to level that way. It made crispy, flat, non-greasy thick cut bacon and delicious roasted potatoes. I love that there are extra support 'columns' so I can make a whole chicken or other heavy item. I'm perhaps more annoyed than I should be at the initial ill fit in the half sheet pan, but I really just need something that simple to work. I took off a star for that infraction. Draining grate works well sitting in a full size hotel pan to drain fried foods. Also work well as a rack in a small toaster oven. These are slightly curved downward towards the center but still a great product overall. We use them to set our cakes on for glazing and let the excess drip through to a tray underneath. Good product and durable for our needs. We use for both pastry and Savory Sides of the kitchen. Would Highly recommend this and would re order it! I had originally thought to purchase the full sheet draining grate but I am glad that I decided on the half sheet. As a cookie crafter, I often have cookies ready to go in the oven, cooling, partially decorated and drying. With that many projects going on, using the half sheet draining grate allows me the flexibility to work on many different things at once. I have about a dozen of these and will be getting more. They are great for a drip tray for dipped cookies and petit fours. Great buy for the price! This draining grate is fantastic quality and pairs well with the half sheet pan also available on this site. Perfect for those oven "fried" foods and prevents them from getting soggy, can't beat that! Excellent construction. It arrived to me only very marginally warped, but was easily bent back straight. Fits very nicely into a half sheet pan and works great for keeping food off the pan during cooking/draining. These are great for all our fried foods on top of half sheet pans. Just be sure when hand washing to wear gloves - a couple of them have had stragglers of metal that have cut hands. These grates are sturdy and provide a lot of space for cooling hot items or draining food in or out of the oven. They are very useful and also easy to store. I knew when I decided to bake receipes that was three generations long, I would need a fantastic cookie sheet and a drain grate for after they were done. I was totally surprised when I located a great cookie sheet and 1/2 size draining grate to use when the cookies or cakes was done. The price was so great and the clean up was easier than I expected as I hate to do dishes etc. The cookie sheet and grate I purchased here on WEB.Com and I ordered other sizes also for candy making . We use these as cooling racks for cookies and bars and they work really well. They fit into the half size bun pans from Webstaurant Store as well. This grate fits well in a half sheet pan and is perfect for making crispy bacon without all the grease - among other baked products. I love using these as cooling racks in my bakery. I like them so much because the wire is somewhat more tightly "woven" than other racks. We actually use them to let air flow under fondant decorations! These grates were a great value and are very sturdy. We use them to cool donuts then ice them while still on the draining grate. These trays are made very well, feel completely durable and fit perfectly on a half-sized baking tray. On top of cooling baked foods on them, I also use them in the oven for bacon, and in the fridge to allow air flow when drying out proteins. I bought these to use for everything from cooling baked goods to roasting meats. These pans are very versatile and can be used for many purposes. Perfect pan for roasting in the oven or draining food. Love how it fits in the shet pan so well, and all the metal is attached so well food doesnt get stuck in the crevices. Good grate. Works great for a drying rack, or to cook bacon on . Do not put over open flame. It's not meant for that! Use as intended, and it will serve you well. This is one of those items that you don't think you need until you have one and start using it. They are indispensable when making multiple batches and this one is a great value. The gauge of the wiring is thick and sturdy and the welds are all extremely solid. It will last for years of use. This is such a great wire rack and fits perfect in a half sheet pan, i have used it several times as a cooling rack and also as a roasting rack for chicken. Love these racks, they come in very handy when cooling cookies or cakes but really I use them to cover petie fours with poured fondant! I really enjoyed using this product unfortunately after a few uses it got pretty rusty and I had to throw it out. I guess I have to spend a bit more for a better quality one. Thank you for your review! We are sorry to hear that the drain grate you purchased started to rust. For a more durable option, try this Vollrath Draining Grate instead. This grate is great for many different applications! It works well for cooling off cookies fresh from the oven. It also works very well for placing underneath a hot dish fresh off of the stove top onto the dinner table. I used it quite often and have been very impressed thus far. I needed these to start ramping up my baking for the holidays this year, and they are just as well constructed and well made as the ones you can buy at the fancy cooking stores...and MUCH cheaper. Really great product! These cooling racks are very strong, I don't think I could bend them if I tried. Obviously, they do their job as a cooling rack, but combine them with the half sheet pan and you have the perfect set-up for oven baked bacon. This is a great item for the price. Love that it fits perfectly inside half sheet pans. I agree with the other reviewers who have noticed a couple of imperfections: 1. it develops rust spots and 2. some of the welds are not very good and have come loose, meaning some of the wires wiggle around a bit. So far it's still usable, and I use it often for both for cooking and cooling. It's also a bit tricky to clean--I have found that after you use it for something like bacon, the dishwasher is useless and you have to end up scrubbing each wire by hand. These are great grates! We use them for baking, roasting, cooling, etc. The only negative I found was some of them are cheaply made and skipped by the QA people, and have razor sharp edges on them... A quick work with a file and they are dull now. wow this is a great sturdy cooling rack for an amazing price. couldn't decide if I should spend the $20 and order the Vollrath brand but am happy I just got this one and saved the $15. much better quality than I was expecting! I didn't know this half sheet pan footed draining grate existed until I found it on Webstaurant. I purchased it and now I use it all the time for a variety of things. It fits perfectly on all of my 1/2 sheet pans, not just my Webstaurant pans. These are very very sturdy draining grates. We use them for many applications in our kitchen and they hold up well to our use. I would recommend this product. These are good and cheap and work well for what they are suppose to do. One drawback is that they will start to develop rust spots over time mainly along where the spot welds are, which is why only 4 stars. I use these racks for just about everything I let my cakes cool on them . They are great for saving your icing when you pour over petite fours. Purchased this along with the Advance Tabco 18-8A-13 Half Size Sheet Pan . Unfortunately the grate is a few mm too wide to sit inside the sheet pan so the feet quite don't touch the bottom. Also the middle of the grate curves up slightly. Thank you for your review! We are sorry that the draining grates are not fitting properly in your sheet pans. Our experts recommend this 18 Gauge Half Size Aluminum Bun / Sheet Pan for a better fit. Perfectly fits my half sheet trays. I love using these grates for cooling baked goods. Also comes in really handy as a draining rack when I'm making bacon or frying foods. Great product at a great price. I love my draining grate I use them for cakes, pies, cookies, and breads. The product is built to last. 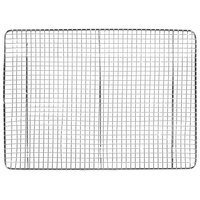 this 12 x 16 " half pan draining grate is a must have for any kitchen. we use them to hold baked goods while they cool. always stay straight and never bend. easy to clean and a great price to match. Very thick/Heavy Duty. These will last MANY years. Very easy to clean, and I like that they have 3 "support" beams on the bottom, so it doesn't bow when a heavy load is on it. Great for Crisping Bacon in the oven, or using as a Cooling rack! Perfect size for the half size sheet pan. It is very sturdy with a high build quality. I highly recommend this draining grate for any kitchen. Great cooling rack!!! This is a great size for cupcakes, cookies and cakes. Made very sturdy from good material. I will be ordering a couple more! Finally a grate that fits perfectly in the half size pans. Make sure you dry them well after washing otherwise they'll rust in a few spots (at the joints) hence why I gave it 4 stars but at the price they sell them it's not much of a problem. This drain pan works perfectly as a cooling rack for our baked goods. It has a low profile so taller items don't touch the next tray on bun racks. Also, no moving parts! Great quality, sturdy and will not bend. This fits perfectly into a standard sized bus tub. For the price this is a great deal, very happy with this product. I bought the draining grate to use as a cooling rack for my cookies. It fits perfectly in the half sheet pan that I also purchased for cookies. We use these as drying racks and they are perfect. Sturdy enough for heavy items and properly footed so they don't sag. Washes up nicely too. We use this for all our baking needs and we do lot especially during Thanksgiving/Christmas season. Holds lots of cookies. Also love that this is footed. It's a good, solid weight and I've already used it as both a cooling rack and draining grate. It fits perfectly inside my half-sheet pan. I have a black-coated version of this that I bought elsewhere 10 years ago but paid quite a bit more for it. It's holding up nicely but has some rusting issues. If I decide to buy another one I will probably go for the stainless steel one rather than the chrome plated but I'm very happy for the price. These are a durable and a great price with a multitude of uses. I love them. Use them as a cooling rack, draining fried foods, but also in the oven. The grates are a perfect size and nothing falls through. Fits perfectly in my half sheet pans. Very sturdy and also can dual as a cooling rack. Also useful as a draining rack for frying. These racks are prefect for cooling cakes and cookies on. The grate is nice and small so no matter what size treat I cool on it they don't warp or fall through. These grates are very nice. They seem very sturdy and are a great value. They hold up well in the oven with no noticable warping or bending. These grates are awesome. Great for cooking bacon in the oven and a nice cooling rack for cookies. As you can see it fits a half sheet pan fine. It fits in a Advance Tabco 18-8A-13 Half Size Sheet Pan 18 Gauge Aluminum pretty well. Easy to clean, fits in the sheet pan perfectly. Great price, as well. So many uses for this rack! Try bacon in the oven. This rack allows the heat to circulate around the bacon, so it comes out perfectly cooked! This grate is great! I have used it several times for roasting meats - chicken breasts, meatballs, pork tenderloins, etc., and am very happy with it. A quick spritz with non-stick cooking spray make s easy clean up. It seems very sturdy, and is much nicer than any roasting racks I've had in the past. Bought this pan to use as a cooling rack for my baked goods, but have found so many other uses. Looking forward to using it to bake crisp chicken wings. Love the smaller grate squares offer a more sturdy platform. Only regret is I should have bought 2. You can use this for many different things. You used in oven to cook subs on. worked great in high temp. ovens. easy to use store and wash. I found this incredibly useful as a cooling rack in my home kitchen. It is very well made and great quality, especially for the low price. I would highly recommend this for any home cook, especially those that do a lot of baking. Good, low cost, utilitarian cooling rack. Works well for a whole tray of cookies or muffins. Its not tall off the counter, but it works well. I like the sturdy nature of the rack since its easy to put heavy pans on and other things for draining without fear of bending or breaking. This is a very well made and durable grate. The size makes this item very versatile to use and easy to store. We have used it to drain fried foods as well as a cooling rack. Very solid draining grate, cooling rack, or whatever you may choose to use it for. It has held up to many harsh scrubbings and chemical degreasers. I use it for a variety of uses and have not found a situation in which it doesn't excel. It can be difficult to clean depending on what it is being used for, but this is to be expected with a product like this. When you have a limited amount of space and are working with a smaller over this Rack does the job. Great to chocolate dipping or draining fried foods and the cost is wonderful. I was looking for a great deal on wire racks. This is just one of those items you can't find at a good price locally. The site has the best quailty rack I have seen and at half the price of the ones I found at my local supply shop. A great basic tool! This product is essential for any chef. I use it for everything from reheating to baking. Great price and quality item. Definitely would recommend this. This draining grate is very sturdy and is large enough for two nine inch cakes to fit together. I could also get 24 cupcakes on it to cool. I believe I bought this for a rather unorthodox use, cooking bacon. This grate fits nearly perfectly over my baking sheet, allowing me to cook my bacon in the oven without worrying about it becoming soggy from drowning in its own grease. For this purpose, it works admirably. This Half-Size footed draining grate is great for cooking bacon in the oven. I set this draining grate in a 12x16 half sheet pan and the bacon does great everytime and NO MESS. I also use this draining grate to cool cookies and drain foods after frying. This item works best when you order a 12x16 half sheet pan from Webstaurant. The 1/2 size draining grate for sheet pans works just great. It can be used as a drip rack, as well as a cooling rack on the sheet pan. This is a relatively sturdy grate that holds up quite well to whatever you will do with it. I would suggest that you be careful how you use it though as ours had some rust on it after a couple of uses. We would let it air dry after washing and this apparently caused the rust. This cooling rack is wonderful. It is sturdy and fits exactly into the half sheet pan, I use it for my cookies ,breads and its perfect for glaze or ganaches pastries and cakes . These racks are very well made. Very durable for cooling or for oven use. I would give it 5 stars if they stacked better together when storing multiple together. They fit very well in half-sheet pans. The half-sized footed draining grate for bun / sheet pan is GREAT for pretty much any kitchen task. I use it mostly for cooling cookies and cupcakes. These Half Sized draining grates are perfect for using as a cooling rack for baked goods. It's also great for cloaking desserts in chocolate the grate allows the excess chocolate to flow through. This drain grate is the perfect size to fit in the half size sheet pan. The grate has small "box" size holes to prevent food from slipping through. Great for draining fried chicken in the oven to remove some of the fat. Great product at a great price. I use it as a draining rack and as a cooling rack - works well either way. It also fits inside my half sheet pans perfectly. I use this as a cooling rack for baked goods such as breads and cookies. Transferring them off the baking sheet and onto this allows everything to cool quickly. I store it on it's side along with my cutting boards so it hardly takes up much space. This grate is high quality and fits my half bun pan perfectly. It is so useful for so many drainage tasks and cleans up like a charm. Love my new Half-Sized Footed Draining Grate for Bun / Sheet Pan. I have been wanted to add these to my kitchen for quite some time. Not only to use as a wonderful cooling rack, but for cooking in the oven as well by putting meat, fish and/or vegetables on the rack and baking. Or for oven frying chicken. I bought this item as a cooling rack for home use. I usually bake 20 to 24 cookies at once and I need 2 cooling racks to cool them. With this, I only need one. I can easily fit 20 cookies on this without the cookies overlapping. It looks really sturdy too. This rack works well for cooling my baked goods. It's sturdy and has a good weight to it. It does a great job of cooling my cakes and helps to even out the tops. Exactly what I was looking for in size and material and at a great price. Holds a half sheet pan for cooling, then fits all the contents from the pan to finish cooling. Very sturdy, too. These grates are reinforced for strength, but don't weigh a ton. They are well finished with no rough or sharp edges. A perfect fit for the half-size sheet pans they are made for. Absolutely the best price I found. This is the rack to have for cooling cakes, loaves, cookies. Because it's meshed, even small, thin cookies don't fall through the way they do with racks made of narrow strips of wire. It fits perfectly into a half sheet pan, so it's excellent for applying ganache or wet fillings; the excess that drips through to the pan can be collected and reused. I bought these as a gift for my Mom because she liked the ones I had so well! They are a great price for these cooling racks and they are useful for many different things! This cooling rack / draining grate is great to use for so many things. I use it for cooling cookies, cupcakes, and cakes. I also use it to drain icing off of my petit fours. This half size roasting rack is a great item to have in your kitchen. It can be used for many different things such as cooling baked goods to resting meats. I like that footed draining pan so much, I use it to cool down my breads, mini cakes, cookies, muffins and so on. I recommend it. I have many uses for these draining grates. The space between the grates is small which allows even the smallest of cookies to be evenly supported and not slip through the cracks. I have also found them to be perfect for baking bacon. Glazing cakes and cookies is also made easy with the draining grate. For the price and quality, I couldn’t be happier. Great draining grate! I appreciate the craftmanship of the grate and it fits the sheet pan perfectly. I use mine as a cooling rack as well as a draining grate. I will definitely buy more of these. Used to cool pans directly on and also the actual cakes, cupcakes, and other baked goodies. I use my cooling racks (with a sheet pan underneath) for covering cakes in chocolate ganache. The rack allows the extra chocolate to drip through so you don't end up with a puddle of chocolate on the bottom of your beautiful cakes. Highly recommend these racks. Very useful. A great item to have in any bakery! We use these from covering strawberries in chocolate to letting baked goods cool after coming out of the oven. These are awesome and so great to have. I mostly use them for decorating chocolates. But they are also great for using as a resting rack at the grill station! Great! I've used it for cookies and also cooking Bacon in the oven. Bacon was Crisp and I was still able to save my bacon drippings which dripped through. Draining gate/cooling rack is a must for any kitchen. This one gets the job done well. I do wish the surface were a bit more level, as they tend to curve up towards the middle, but this is only slight. For foods with a wide surface area (i.e. cookies, patries, etc. ), it won't be a problem. But for smaller foods that might roll off, use caution. They are a bit lighter in weight than I expected, but performance and durability are not affected by this. Overall its a pretty good product, for the value. The grates are great no pun intended :) they are easy to clean up and sturdy. It held 2 heavy cheesecakes in the pans without bending at all. I will defintely buy more of these. what a life saver, great for holing cookies or cook bacon. all the greas will drip in the tray and you get a nice crispy bacon. This rack fits great inside the half sheet pan. It is great because it keeps the mess off of the counter and makes it easy to move things while on the rack. I love this cooling rack. I really enjoy using it when I bake smaller cookies that way they don't fall through because the wires are so close together. I get a lot of use out of this. Works great as a cooling rack when we make waffles in bulk for freezing, or when we make bacon in the oven. Cleans easily in the dishwasher. Excellent product for resting meats, cooling cookies and bread and even roasting meats!! Great multi-use product! Worth every penny! Durable and long lasting!! Can not be the price!!! Perfect size! These fit snugly into half sheet pans and are very sturdy. Hard to beat at this price point. I am a home user, not a professional, and would highly recommend these for other home users. This grate works great with the half size sheet pans. The half sheet fits the pans really well and keeps food crisper since it can get heat all the way around it. These grates are a must have for every kitchen! They fit perfectly inside of a half sheet pan, are elevated for good air flow, and are very easy to clean. Perfect for cooling down cookies, resting pies, and even for baking bacon in the oven! The draining grate is very helpful in the kitchen. It is a standard grate and is useful for holding many of the items we use. I love this product. It fits my 1/2 sheet pans perfectly and is well constructed. It is great for cooking bacon in the oven and the dishwasher took care of the grease without a problem. It also works well for drying vegetables. I will buy another one on my next order. These are well made grates that fit a half sheet pan perfectly. We use these grates for baking chicken and ribs. If you put a piece of parchment paper down clean up is a breeze.